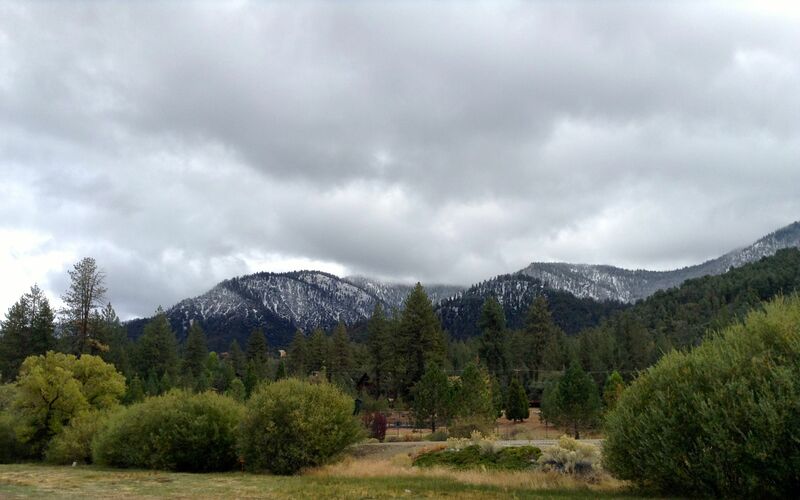 Here in the mountain valley which the Chumash called the Centre of the World, I found myself caught between two Thanksgiving Days. I wasn’t home in Toronto for Canada’s day of thanks on the second Monday of October, and I won’t be here on November 27, the fourth Thursday in November, for the American Thanksgiving. And yet I had much to be thankful for and I wanted to express it. Luckily a birthday came along. I began planning. Well, let’s be honest. First, I took stock. Was I up to cooking such a meal? I factored in my advanced age, my aching back and divided by thankfulness. The result was a decimal zero, zero, single digit. In other words, no prob! Not turkey. Sorry turkey farmers, I don’t like your bird enough to go to all that bother. No our preferred protein is roast beast, i.e. a beef rib roast. Since I no longer have a house to mortgage, that was a sobering thought, but I said, what the heck, I’ve got a line of credit. In the event, it cost only $126 for 4 ribs, with the bones cut off and tied back on. The butcher worked away at it for 15 minutes while I looked at wine. Of course there would be champagne and a good bottle of red. I found a bottle of Veuve Cliquot, or the Widow, on the top shelf and the wine guy who reached it down recommended a pinot noir from the Santa Barbara area, just across the mountains from the Centre of the World. I added a bottle of chardonnay for the cook in case her back got going. I had found a “Classic Caesar Salad” recipe on line and Jamie Oliver’s root vegetable mash. Those ingredients were cheap enough as were the Brussell sprouts that I decided on at the last minute to add green to the main course. Clara offered to split the cost, but I said it was my treat. I didn’t want to have to do CPR in the middle of the Santa Clarita Whole Foods and besides I had that generous line of credit. That was Thursday and dinner would be on Sunday. The plan was to to turn up the fridge and store the roast on the back shelf at the bottom. The butcher, fearful for his rep didn’t want to endorse that plan wholeheartedly, but I explained about winding mountain roads and a long trip down the I 5. In fact, it worked very well, although a container of green soup froze solid. It was a two household project (Two households both alike in dignity/In fair Verona, etc). One had the necessary more or less empty fridge, but I would be cooking in the other house, the one in the pines where I could find the utensils I needed. Saturday morning, I had the fridge house to myself, so I peeled the root veg into a big heavy pot and covered them with spring water. The tap water here is very heavily chlorinated because of the drought, I imagine. The wells are lower than ever. When I drink tea made with it, I fell as if I’m drinking from a tea flavoured swimming pool. I stashed the veg in the fridge and drove the golf cart over to the other house. I had it to myself as well, the occupants having made their weekly trip to Los Angeles for treatment and shopping. I put on music on my IPod and began to prep the salad. I listened to the birthday boy’s album Shadows of Another Time (www.allmusic.com) as I worked and used his Cuisinart to make the Caesar dressing. By the time, I finished and cleaned up, I had heard most of it twice and gone on to listen to 4 versions of Carrickfergus. Sitting at the table, I began tearing up a baguette for croutons. With the music off, I was began to think of why I felt thankful. Together as a family, we had found the right medical help and routed a potentially deadly disease. Now it was being managed. Certainly, refinements to medication were still being made, certainly it would be a lifelong condition, but after 5 months, it was manageable. Or the patient had learned to manage it. Sitting there, I felt all trace of my former picture of myself -78, alienated from a beloved son, prone to isolation in a cold city, survivor of a traumatic life – drop away. I was truly at the Centre of the World, washed through with love as I have seldom been even in the spring of my life and my first and abiding love. When I came back into the house on Sunday morning, it was fragrant with coffee, bacon and pancakes already. We carried in the big pot and the roast from the golf cart. I rubbed the cut ends of the roast with butter, no salt so as to preserve the juices. When the oven got up to 450, I put it in for 20 minutes. Then I turned it down to 280. It turned out the Brussell sprouts looked like small cabbages, so I sliced them thin, fried some bacon, added the sprouts, discovered the skillet was too small, put them in a pot and added a cup of chicken stock. Just before dinner, I would cook them 15 minutes. I cooked the root veg -carrots, parsnips and rutabaga, early and got my sous chef to mash them with butter. I wasn’t up to that upper body exercise, but I was pleased to note that being thankful seemed to keep back pain at bay. I sat at the table to put together the salads. As dinner time drew near, I used a digital thermometer to monitor the meat. Luckily there was one. Cooking America which posted how to cook the perfect rib roast had threatened to wash its hands of me, if I didn’t use one. At a certain point it read 113. I wanted 120, knowing the meat would rise to medium rare. Fifteen minutes later, still 113. I jacked the oven heat up to 350 and 10 minutes later, the thermometer read 125. I took it out of the roast pan and wrapped it loosely with tin foil. 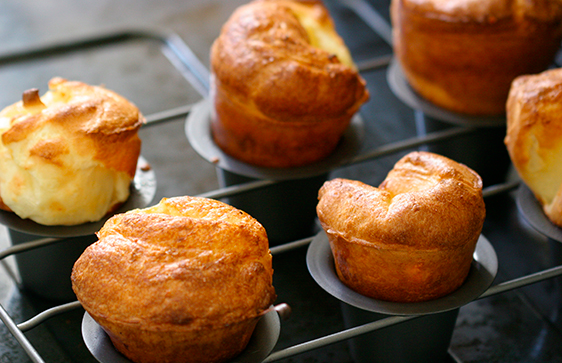 The sous chef mixed up the ingredients I had measured out for Yorkshire pudding, poured the beef drippings into popover pans, heated them in a 400 degree oven and then poured in the batter. Twenty minutes later when she turned the heat down to 350, they were already rising. I was somewhat taken aback to discover all the beef drippings gone, but olive oil worked just as well with the scrapings from the roast pan. Beef stock and red wine added to the roux produced a tasty and copious gravy. Reheating the mash took a good deal of stirring, but the excess water cooked off. The sprouts were tender by now and just needed to be lifted out with a slotted spoon. In both cases things hadn’t worked out as the recipe said and I had had to wing it. The last ingredient, the guests, arrived just in time. 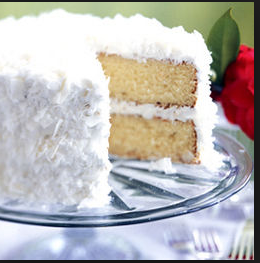 We had the champagne with the cake, a tropical coconut cake from Susiecakes in Manhattan Beach, which didn’t look exactly like this one. It had pineapple in the middle. Thankfulness is a great shortcut to happiness and mental health. And relief of back pain. PS I drank the chardonnay anyway.